With the Raiders' move to Los Angeles prior to the 1982 season, the rabid Oakland fans were left without a team. This is the void that Tad Taube hoped to fill with his Oakland Invaders (rhymes with Raiders), originally called the Bay Area Invaders. The Invaders, under coach John Ralston, struggled to begin the 1983 season, but went 5-3 over the last eight games to win the Pacific Division title and secure a playoff berth. In front of 60,237 at the Pontiac Silverdome, the Invaders fell to the Michigan Panthers, 37-21. Arthur Whittington ran for 1,043 yards and hauled in 66 catches, and Fred Besana passed for 3,980 yards and 21 touchdowns on the season. Tight end Raymond Chester led the squad with 68 catches for 951 yards. To say that Oakland stumbled in 1984 is a major understatement. The Invaders began the year 0-9, scoring a paltry 82 points in the first half of the year. Chuck Hutchison was named interim coach in week four, but it took the Invaders until the tenth week to get cooking. Oakland then reeled off seven straight wins to finish with a respectable year thanks in large part to doubling their scoring in the second half of the year and a defense that was tough the whole season. Runningback Eric Jordan's emergence with three consecutive 100-yard games was a major factor in the offense's rebound. Besana was solid, and Gordon Banks emerged at receiver with 64 catches for 937 yards. Following the league's second season, the Invaders merged with the Michigan Panthers, and the influx of Michigan talent along with new coach Charlie Sumner propelled Oakland to the Western Conference championship. 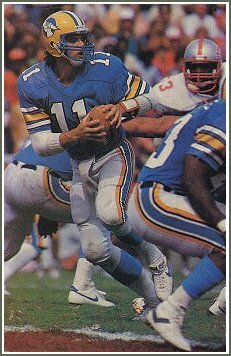 Bobby Hebert took the reins at QB, throwing for 3,811 yards and 30 touchdowns. 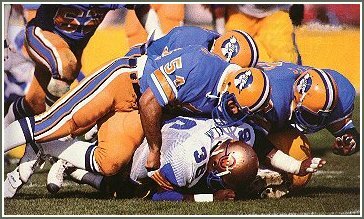 Albert Bentley (1,020 yards) and John Williams (857 yards) spearheaded an improved ground game, and Anthony Carter (70 catches for 1,323 yards, 14 TDS), Gordon Banks (62 catches for 1,115 yards) and Derek Holloway (47 catches for 824 yards) comprised the USFL's best receiving trio. In the playoffs, Oakland downed the Tampa Bay Bandits, 48-27, in the quarterfinals and battled past the Memphis Showboats, 28-19, in the semifinals. The Invaders and Baltimore Stars played a great championship game with the Stars winning 28-24. Oakland was driving for the winning score when a personal foul penalty put the endzone out of reach. Their Finest Hour: The vastly improved Invaders looked to be one of the better teams headed into 1985, but their play in the first half of their week two game against the Baltimore Stars begged otherwise. Chuck Fusina had powered the Stars to a 17-0 lead at halftime with two touchdowns, and the Baltimore defense stymied Oakland throughout the opening half. The second half, however, was an entirely different story. The Invaders defense finally stopped the Stars in the third, but Oakland was still having trouble moving the ball. Finally, Hebert broke through with a 42-yard touchdown pass to Gordon Banks as the third period ended. Minutes later, Novo Bojovic connected on a long field goal, and Oakland was suddenly back in the game. The teams battled back and forth until late in the game when Hebert drove the Invaders to the Baltimore 18 with time left for one more play. Hebert faded back, spotted Carter over the middle, and then hit the leaping receiver for the tying score. Neither team scored in overtime, and the game ended a 17-17 tie- the only deadlock in league history.